UK company TAD Enterprises Ltd has signed a contract with Cargotec for the delivery of a Siwertell 5 000 S mobile unloader for cement-handling operations in the Black Sea port ofYeysk, south of Rostov, in Russia. Delivery is planned for February 2014 from Cargotec's production plant in Bjuv, Sweden. “The new Siwertell unit will offer the company a flexible, low cost cement handling operation,” says Jörgen Ojeda, Siwertell sales director. “TAD Enterprises currently employs a pneumatic mobile unloader, but is not happy with its performance. The company also expressed concerns about the level of maintenance that this type of unloading system demands. “With more than 400 units put on the market since 1992, Siwertell unloading systems have proven themselves in service. This market-leading reputation for reliability and the support offered by Cargotec Sweden Bulk Handling were essential elements in securing this new contract,” explains Ojeda. The diesel-powered, trailer-based Siwertell 5 000 S system will be used to load trucks alongside the berth for further transportation by road. It will be fitted with a double-bellows system for handling cement continuously at a rated capacity of 300tph (tonnes per hour). The unit will also have a dust filter system to ensure a low environmental impact. Oman’s leading cement producer, Raysut Cement Company SOAG, has ordered a high capacity road-mobile Siwertell unloading and conveying system for its cement-handing operations at the ports of Duqm and Sohar. The order has been booked into Cargotec’s 2013 fourth quarter order intake. The contract, which supports the company’s expansion plans in Oman, comprises the delivery of a road-mobile Siwertell 10 000 S unloader unit and a road-mobile Siwertell PumpMaster blow pump conveying unit, commissioning, supervision, and spare parts. The combination of screw type unloader and blow pump conveyor has a number of advantages including the low energy consumption of mechanical unloading combined with the convenience of pneumatic conveying. The system will have a rated cement discharge and conveying capacity of 300tph. “This is a particularly high value, considering that the distance from the unloader and blow pump unit to the silo top is about 270m with an elevation of about 40m,” explains Peter Göransson, Siwertell Sales Manager. The system will be built at Cargotec’s Siwertell manufacturing facilities in Bjuv, Sweden, and delivered by July 2014. It will serve the Sultanate of Oman’s eastern port of Duqm, located on the Arabian Sea, and one of its largest ports, Sohar, which is situated on the country’s north coast in the Gulf of Oman. In 2013,VIGAN Engineering — a very well-known equipment supplier to the agribulk sector — commissioned a range of CSU (continuous ship unloader) projects. These projects, for regions including Egypt and Bangladesh, were extremely challenging. Transshipment is a popular process for the handling of bulk commodities — not only grains, but also others including coal and iron ore. Transshipment reduces capital investment costs, and makes it possible to enjoy the regional advantages of transport by barge into the nearby hinterland, or by coastal vessels to local markets. Panamax and post-Panamax vessels require a very deep draught, so transshipping means there is no need to carry out expensive dredging and/or build a quay for loading/unloading equipment. Transshipment can also be very flexible, allowing for operations with vessels of various sizes and different characteristics — geared, non-geared, for example. Nile Stevedoring and Storage Company (NSSC), which has its main activities in Alexandria (Egypt), opted for this alternative. The transshipment is carried out with special VIGAN NIV type equipment (see picture and graphic on p97) working at a rate of 600tph (metric tonnes per hour). The transshipment pontoon berths alongside the large size vessels and the pneumatic CSU discharges the various ship holds and directly load river barges. Under the gantry main platform, a hopper behaves as a buffer in order to maximize the handling rates by reducing operational stoppages, for instance between the barge mooring and sailing. For barge unloading, four portable type 200 VIGAN machines are mounted on small specially designed gantries (see above): the rotation capability of the small platforms is to maximizing the hatch coverage by the suction nozzle. A small independent crane allows for the lifting of auxiliary equipment into the barges and therefore the performances of efficient cleaning with pneumatic machines is even more boosted: the hatch emptying is not any more a major concern as usual with traditional discontinuous system such as grabs. In 2004, the first pneumatic VIGAN CSU was installed at Chittagong port for the Directorate General for Foods. With the continuous growth of population in this country, as well as increased economic activities, imports of agricultural commodities continue to rise, so higher unloading capabilities are needed. The same state-owned organization was so satisfied with the first machine that, in 2012, it ordered a second NIV-type machine from VIGAN. On a self-propelled rail-mounted gantry, this VIGAN pneumatic CSU with a nominal capacity of 250tph discharges directly onto a quay side conveyor. The four stage turbo-blower, with its associated electrical control devices, keeps energy consumption below 0.8kWtph. The air-conditioned operator cabin allows for continuous monitoring of the unloading operations with a certain comfort for the worker in charge: this is of great importance in such a hot and humid climate. Also — and standard in VIGAN equipment (see parts in grey colour) — many parts are hot dipped galvanized not just because this offers the most reliable anti-rust system but also as a main safety factor for stairs, gangways and main boom structure long term protection. Only one operator is required during 80–90 % of the hold volume and maximum safety is achieved as all the unloading equipment movements for its own displacement or of the suction nozzle into the products are at low speeds. There is no dust or spillage to cause disturbance to the port operators and to the environment. Further to the delivery a few years ago of a large 400tph machine to the Port of Amirabad in northern Iraq alongside the Caspian Sea,VIGAN has delivered another unit to this port. This new machine is a tower-type NIV unit, with a capacity of 220tph, and will be used by the ASC Matin company. This towable machine has its own generator, and two outlets for loading trucks. 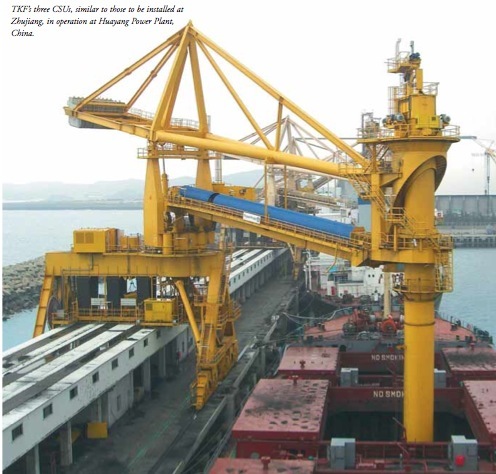 A twin belt machine SIMPORTER was commissioned at the end of 2013 in the port of GUNSAN: the CSU offers a capacity of 800tph for grains, and is on rails with cable. Bühler manufactures both mechanical (Portalink for sea going vessels, Bargolink for river barge handling) and pneumatic (Portanova) continuous ship unloaders (CSUs). Its models are installed worldwide, and are customized to ensure that the customer receives the best possible unit that suits the local conditions and requirements. The Portalink model is often the best solution for the customer, as it offers clear advantages in terms of lower operating costs and increased efficiency, due to the easy and auto sink-in function. Initial investment costs are higher, but this is more than offset by the lower operating costs. All types of free-flowing product — including grains and mealy products like soya meal — can be handled by Bühler’s mechanical and pneumatic unloaders. Major clients, especially for the mechanical unloaders, include grain terminals and larger end-users. For example, Ishinomaki in Japan has invested in a Portalink, a project which was completed in 2013. Similarly, Santander in Spain and Tokachi in Japan both have a Portalink 600 with a nominal capacity of 600tph (tonnes per hour) for wheat and can handle vessels up to 65,000dwt. A Bargolink has been operational at Vupik in Croatia since the end of 2012. In terms of remaining competitive in the market, Bühler continuously monitors and reacts to market conditions, in particular the individual requirements of the customer. In this way, it is able to act and develop new solutions for current and future trends and anticipate on stricter regulations. various grain terminal extensions in Africa. For earthquake-sensitive areas such as Japan, Bühler has developed the earthquake absorber. This can withstand even significant earthquakes and thus support continuity of the port hit by the earthquake. Bühler is a specialist and technology partner for plant and equipment and related services for processing basic foods and manufacturing advanced materials. The group is a major supplier of flour production plants, pasta and chocolate production lines, animal feed manufacturing installations, and aluminium die casting systems. The core technologies of the group are in the field of mechanical and thermal process engineering. With its expertise and over 150 years of experience, Bühler time and again rolls out unique and innovative solutions for its customers, helping them achieve success in the marketplace. Over the decades, Bühler has come to be acknowledged as a reliable partner, thanks to its distinct commitment to quality and its global presence. Bühler Group operates in over 140 countries, has a global payroll of over 10,000, and generated sales revenues of CHF2,409 million in fiscal year 2012. ThyssenKrupp Resource Technologies (TKRT, formerly ThyssenKrupp Fördertechnik), one of the world’s leading companies in the field of bulk materials handling equipment and systems, is active in the design, manufacture, installation and commissioning of complete materials handling equipment and systems, as well as individual machines, such as stackers, reclaimers, shiploaders, shipunloaders and wagon tipplers, crushing and screening equipment and opencast mining plant and systems. Recently,TKRT’s Bulk Materials Handling Business Unit based at Rohrbach in Germany has experienced considerable success with the award of new contracts and the construction of individual machines for continuous ship unloading facilities worldwide. Some examples of machines recently installed or currently in design or under construction as well as the new development of continuous ship unloading technology are described in the following article. In February 2010,TKRT received an order for the design and supply of a coal handling plant; including a continuous barge unloader (CBU), a circular stacker and reclaimer system and the pertaining belt conveyor system. The order was placed by PT. Inti Karya Persada Tehnik (IKPT) on behalf of PUPUK KALTIM (PKT), a key player in the fertilizer industry of Indonesia for the Boiler Plant of Bontang Fertilizer Complex in Kalimantan, Borneo. covered belt conveyor system for environmental and weather protection. For this project TKF developed a new generation of CBU which will fulfill all requirements in respect of unloading efficiency, environmental protection and low operation and maintenance cost. The CBU will be designed for a design unloading rate of 700tph (tonnes per hour) of coal from barges ranging from 7,000dwt to 10,000dwt. The CBU will be of heavy duty design and construction to operate for a continuous period of 18 hours per day and an annual period of 330 days. The machine consists of a rigid supporting frame construction on wheels, which is able to travel along the length of the barge. Reclaiming is done by a chain bucket elevator, hinged onto the slewing and luffing boom. While reclaiming in either longitudinal direction of the barge, the bucket elevator can be positioned sideways of the boom against the coal pile on the barge for effective reclaiming. From the bucket elevators the coal is transferred directly to the boom conveyor, which in turn feeds it to the portal conveyor. The operation is controlled from the operator’s cabin or from the pier by remote control. Digging depth, speed of the reclaimer and /or traversing is controlled automatically to achieve the required unloading capacity. The reclaiming is achieved in semi- automatic mode, allowing manual positioning and/or operating. TKRT’s previous references for continuous barge unloaders and their excellent track record, including the recent milestone of a high capacity 4,000tph CBU to Bontang Coal Terminal, were deciding factors in the contract being awarded to TKF. This special design of the continuous barge unloader is the first of its kind in Indonesia, although all critical components have been proven in continuous barge unloaders previously supplied by TKF. In all,TKF has already supplied more than 50 continuous ship/barge unloaders, mostly to clients in Indonesia, Korea, China, Taiwan, the Philippines, Malaysia, USA, Great Britain, Spain and Germany. Two-thousand-and-twelve is the year for Indonesian CBU. Besides the installation of a CBU at Bontang, another order was received for a 3,000tph CBU for coal, destined for Kalimantan in Borneo. It will be the third CBU operating in Indonesia, designed and built by TKF. The Arutmin North Pulau Laut Coal Terminal, PT Nusa Tambang Pratama, a company of the well-known Bakrie Group, recently placed the order with TKF. A decisive factor for this decision was, amongst others,TKF’s excellent track record of more than 50 continuous ship and barge unloaders in operation worldwide, some of which have meanwhile been in service for more than 25 years. This latest CBU is designed for unloading 8,000dwt to 10,000dwt open coal barges at a rate of 3,000tph or 3,500m3/h. TKF received in 2008 the order for a CBU with an unloading capacity of 4,000tph. This unloader, operated by PT Indominco Mandiri, has now been successfully in operation at Bontang, also in Kalimantan, since beginning of 2010. Seeing the satisfactory performance of this machine in operation was perhaps what finally convinced the client that the TKF type of CBU design was the right choice. However, not only their high unloading capacity, travelling mobility, low maintenance and installed power and energy consumption, (compared for example to the screw type ship unloader or a conventional grab unloader), but also the efficiency of emptying the hull right down to the bottom of the barges without the use of a Bobcat, and thus making ‘sweeping’ of the barges practically superfluous, are a special advantage of the TKF type of continuous barge unloader. TKRT, Business Unit Materials Handling, better known in former days as PHB or PWH, first developed the bucket elevator type of continuous ship unloader (CSU) at the beginning of the 1970s. Its first CSU, designed to unload asbestos, was commissioned in 1974. It took some years before customers, who until then had been working with conventional grab type ship unloaders, saw the advantages of a CSU compared with the conventional grab type used mostly in those days. Since then however, the TKF type of CSU has made its mark in the field of dry bulk ship unloading. Today TKF CSUs are designed for handling such products as coal, iron ore, phosphate, urea, sand unloading bulk carriers of up to 250,000dwt. In recent years, in particular in countries which depend heavily on importing their fossil fuels, coal-fired power plants are invariably built directly at deep water sea locations with the convenience of having their own coal unloading terminal facilities. Two such coal-fired power plants for example, are the Tanjung Bin and Jimah power stations in Malaysia. Here four TKF CSUs are in operation. Another prime example is the Hou Shi Power Plant in Fujian Province, P.R.of China, where three TKF continuous ship unloaders are in operation. However, also large coal import terminals, for example in China, have in the last ten years turned more and more to using CSUs. Until today,TKF has already supplied in total 15 CSUs to China. In South Korea there are already nine TKF designed CSUs in operation in coal fired power plants. Back in 1994, the new power plant in Guangzhou City, Zhujiang power plant received TKF’s ship unloaders for its coal terminal and put into operation. Since then these ship unloaders have been operating successfully to serve the power plant demand on coals for 3 × 600MW blocks and transshipment of coals for the region. An annual turnover of 6–8 millions tonnes is achieved by these unloaders. With the increase of power consumptions in this region, the power plant started the expansion project of Phase II for the other 1,000MW block. Through an international tender TKF again won the new order for the two further ship unloaders, and this time chain bucket elevator continuous ship unloader. The contract was signed in June 2012 for the supply and installation of two CSUs. These unloaders will be designed for an unloading rate of 1,500–1,650tph and ship sizes up to 70,000dwt, and in the future for 100,000dwt representing outstanding success of TKF in China by covering >75% of market share. For TKF, this follow-up order not only means being awarded a further order, but also represents continuity with respect to design, supply, construction and management and demonstrates the client’s appreciation of and satisfaction with TKF’s performance to date. With this contract,TKRT, one of the world’s leading designers and manufacturers of CSU’s, has once again contributed to the development of China’s coal ports and power plants among with other equipment of more than 60 machines for car dumpers, ship unloaders, shiploaders, stacker-reclaimers, etc.